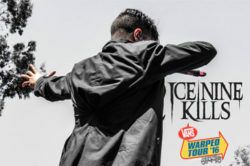 Ice Nine Kills made their triumphant return to California with a high energy set at the Vans Warped Tour. Large festivals can often be a struggle for some bands as they are provided a very limited set time to try to pack as much material in as possible all while keeping the crowd engaged and entertained. This was no challenge for Spencer and the rest of Ice Nine Kills as they whipped the crowd into a frenzy the second they took the stage. Pulling material primarily from their latest album, the critically acclaimed Every Trick In the Book, the band had the crowd screaming, singing and moshing foe the entire 25 minute time slot. I have seen this band play the smallest clubs to the biggest festivals now and I can honestly say that they remain at the top for best live bands.